It's pretty clear where Samsung is going with the X360 laptop when you notice it's branded it as "lighter than air" and say it's the "lightest notebook in its 13.3 inch class" since it weighs just 1.27 kg. Inside there's a 45nm Core 2 Duo mobile processor, mated to a 1280 x 800 pixel LED-backlit screen, and the machine has no internal DVD drive: instead it comes with an external one. Sounds a little familiar, no? 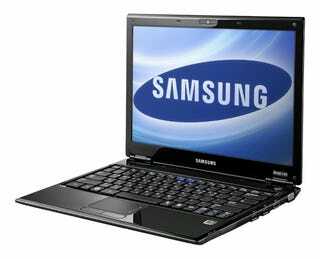 But the battery life is claimed to be 10 hours, by Samsung, and it's got a full array of ports, including an RJ45 socket for wired LAN, a mic-in, three USB 2.0 sockets, a PCI express card slot and a HDMI socket. Somewhat strangely it's also been "sprinkled" with nano silver ion powder to keep the keyboard bacteria-free. It'll be available in September in some European countries, and Russia, China and Hong Kong, but there's no info on the US release or pricing. Extensive press release below. set of features unlike anything of its kind on the market. access to a wide variety of ports..
have everything they need for life on the move," Mr. Kim added. Russia, China and Hong Kong. records in the industry, lowering the total cost ownership. (53 MB/s) for reading and 150 percent faster (28 MB/s) for writing. model. So, the notebook will perform faster and last even longer. is better, because there are fewer breakable parts. which all translates into a measurably lower Total Cost of Ownership. speeds that are 3x faster than previous generations. which require less power to run. is no loss of data. keyboard your system will remain "bacteria free" – for even longer. and you may never need to remember another password! digital image quality on large displays and projectors.